This is my twelfth post about our adventure traveling through Maryland, Delaware, New Jersey, and Pennsylvania. You can find the first post from this trip here and links to all the other educational US travel our family has done here. 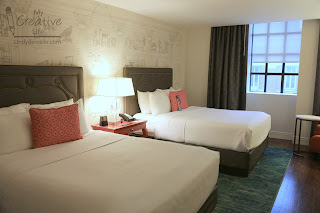 When researching where to stay in a new-to-me city, my main considerations are location and price, as is probably the case for the vast majority of you reading this. (If price is not a consideration for you, I would like to become closer friends and do some traveling together.) Most of the hotels in Baltimore's Inner Harbor are a bit out of our family's comfortable price range, so I started looking at hotels that were walking distance but not right on the water. We like to walk. We also like to stay at charming, non-chain hotels when we're able. Hotel Indigo looked like exactly what we wanted. And it was. We thoroughly enjoyed our stay. The building has its origins as Baltimore's first YMCA. There's no hint about that past inside though! 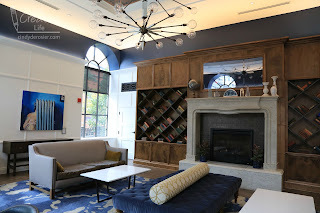 Hotel Indigo is beautifully decorated with a subtle literary theme throughout. We ate at the hotel restaurant, Poets Modern Cocktails and Eats, the first night we were there. It was outstanding. I'd recommend going even if you don't stay at the hotel. (But you should stay at the hotel.) Check out that HUGE piece of cake. We ordered it specifically because it is Maryland's state dessert, Smith Island Cake. It took the efforts of all three of us, but we finished it. And it was spectacular. 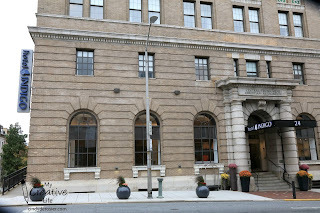 Hotel Indigo is in a great neighborhood and an easy walk from most of what we visited in Baltimore. However, we learned an important lesson our first morning in town, which is that the transition from great neighborhood to less-than-great neighborhood is far more abrupt in Baltimore than in any other city we've ever visited. We had no issues whatsoever, but a quarter mile from our hotel we found ourselves walking through an area where Steve's expensive camera and the phone we were using for navigation suddenly made us feel very conspicuous in a way that we hadn't just a block earlier. 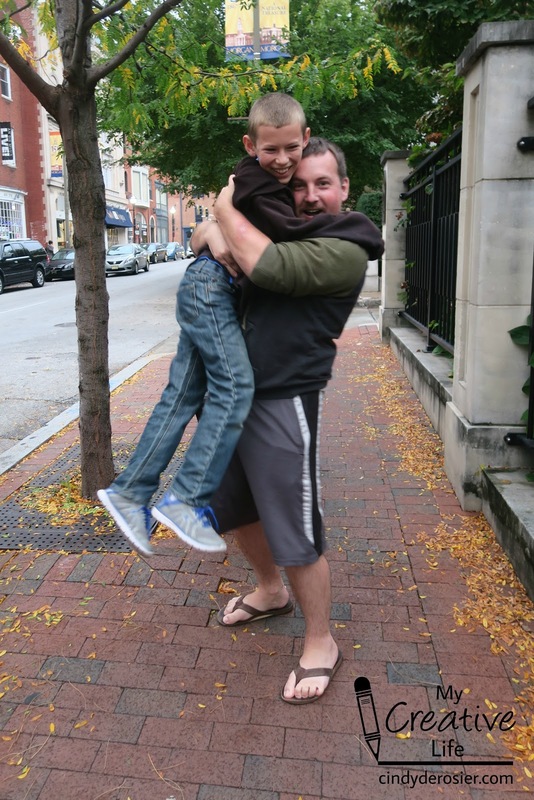 Do not let that scare you off from a visit to Baltimore; as I said, we were totally fine. But plan your walking routes ahead of time. And if you turn a corner and things suddenly don't feel right, backtrack. Use your common sense and be aware of your surroundings, just as you would anywhere you travel. 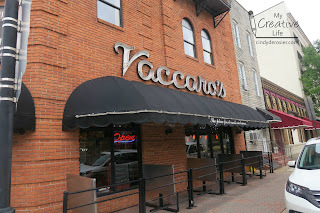 So where else should you eat in Baltimore? 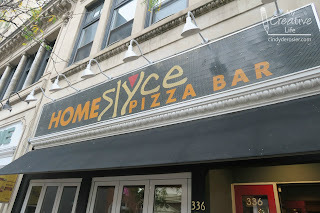 HomeSlyce Pizza Bar. It's two short blocks from Hotel Indigo and the pizza is fabulous. 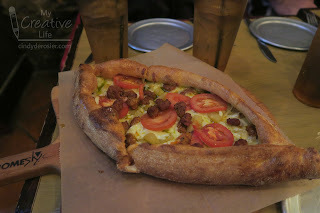 They're famous for their 'Slyce' which is a boat-shaped pizza. 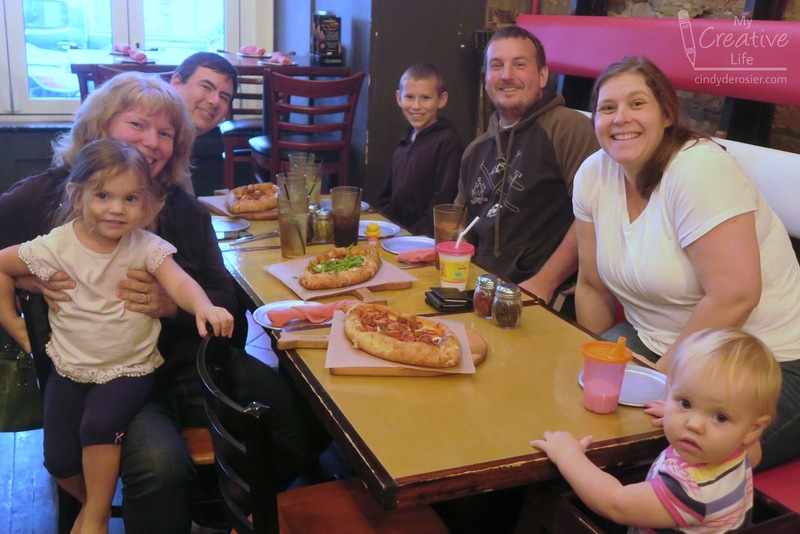 Our good friends Justin and Mikaela and their daughters met us for dinner. Justin used to be the youth director at our church (and my June 2013 companion for Project 41!) and now works for a different church in a Washington DC suburb. It was so good to see them! We ordered 3 different Slyces and it was just the right amount of food for our group of 4 adults, an 11-year old who eats like an adult, a preschooler, and a toddler. Like I said, it was really good to see them. I'm so glad they were willing and able to make the effort to meet us in Baltimore. Where else to eat? 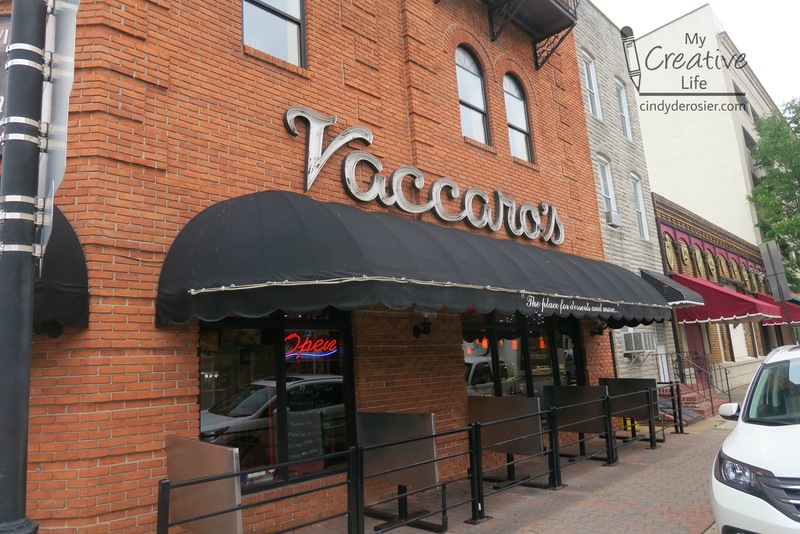 Try Vaccaro's. They're located in Little Italy, just a few blocks from the Inner Harbor. After splitting two of their huge (delicious!) sandwiches, the three of us didn't have nearly enough room to sample all the pastries we'd been drooling over when we entered. 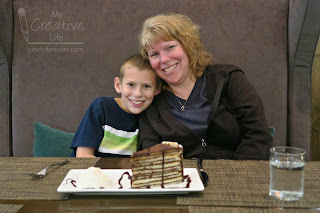 (We should have had dessert first!) 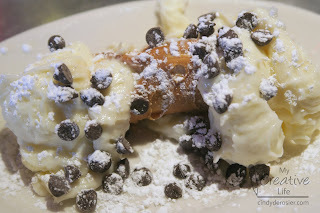 We split one cannoli and it was the best one I've ever had. 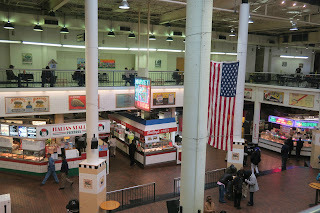 I want to share about one other place where we ate while in Baltimore, which is Lexington Market. My policy is usually not to mention something at all if I don't recommend it, but I want to share my experience in hopes that tourists have a better idea of what to expect. We went to Lexington Market expecting a place like the outstanding Reading Terminal Market in Philadelphia or the Ferry Building in San Francisco. I thought it would be bright and clean and bustling and tourist-friendly and filled with tons of delicious food choices. I was wrong. The area surrounding Lexington Market was gritty, to say the least, and some of that spilled indoors. The market was a bit dirty and a little dark. Quite a few of the stalls were vacant and there was a smell of old fryer oil. I felt really awkward taking a photo. We did end up buying food from two different stalls and it was fine, but nothing I'd go out of my way to recommend. Overall, we had an amazing time in Baltimore. I definitely recommend a visit. It was a great way to wrap up our 12-day adventure through Delaware, Pennsylvania, New Jersey, and Maryland. 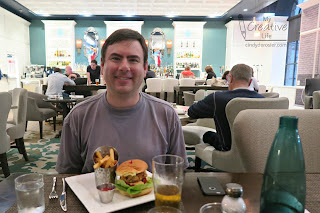 Eventually, I'll share more about our trip, including Trevor's updated 50 States album, packing tips, and information about how I prep for a big trip like this. In the meantime, I have quite a few craft tutorials, recipes, scrapbook layouts to share. 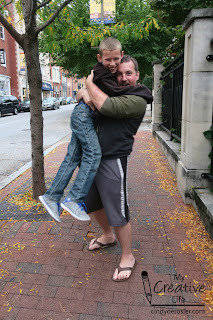 Tomorrow I'll share a craft Trevor and I did that was inspired by our time in Pennsylvania. I love your travel posts...though I am behind and definitely need to go back and catch up! It allows me the chance to see/explore places I may never go and I love the tips for places I may someday go. Have you done Boston? That's our next still-in-the-USA destination. We spent a single day in Boston as part of our New England cruise. It wasn't nearly enough time, so I'm sure we'll be back someday to explore it properly. Baltimore is a beautiful city, but it does have extreme sketchy parts! Glad you were all ok! LOVING the photos!! That pizza boat looks AMAZING!!!!!!!!!!!!!!!!!!! Hi Cindy! I loved reading about and seeing the photos from your trip to Baltimotr!! Well, I've been to some dodgy places in my travels too. Glad that most of your trip went well. I've enjoyed "visiting" via your pictures and recommendations.